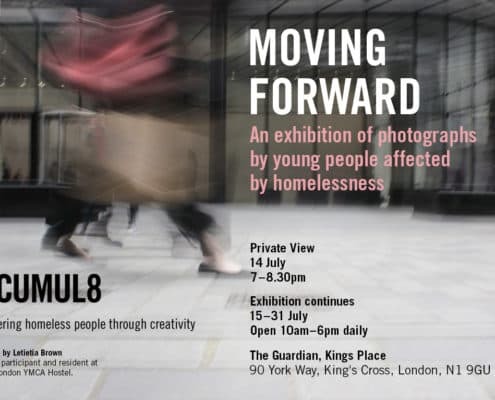 The Accumul8 “Moving Forward” exhibition will showcase the photographs of 11 amazing young people, who are living in hostels across London, and who took part in this year’s Accumul8 photography workshops. 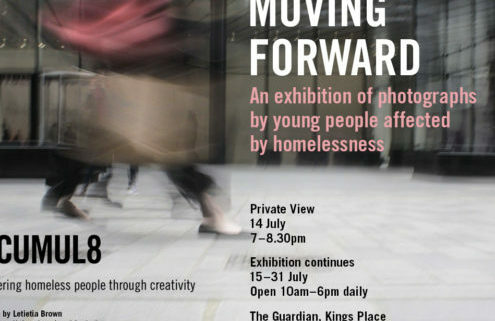 The exhibition takes place at The Guardian, in Kings Cross, and the private view will be an opportunity to see the striking images, meet the photographers and talk to them about their work and experience of attending the Accumul8 project. This year we have created the Accumul8 Scholarship, sponsored by BOP Consulting, to pay for an Accumul8 participant to study on the one year digital media and photography course at Ravensbourne, the scholarship will be awarded on the night of the private view.